On the other hand, I don’t consider myself to be socially inept either. I mean, I can kind of handle the pressure of awkward greetings…with old high-school friends who recognize me but I don’t recognize them (despite like-ing photos of their kids on Facebook), ex-spouses, friends of ex-spouses, people that know me from previous jobs that I don’t recognize (despite being connected with them on LinkedIn), old bosses that don’t have the same spouse and I address them with the ex-spouse’s name….etc, etc. 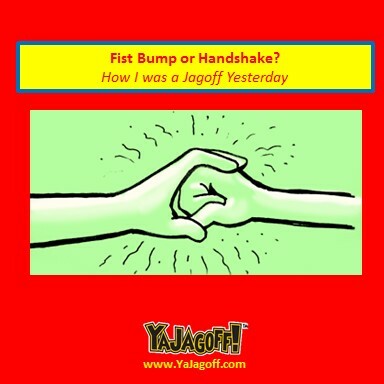 But what I haven’t mastered is…….whether to shake, shake and hug, or fist bump. I blew it again yesterday. I was all excited to meet a former co-worker. Like a movie, I saw him from 25-feet away and we both went in aggressively…moved in… “Hey man!” yelled to each other …closing in quick….the “You look great!” “You too, man!” and then we were within arms length of each other aaaaaaaaaaaand….I put out my hand aaaaaaaand he put out his FIST! We kind of looked at the fluttering hands with an awkward pause as if we were doing some form of secret lodge handshake maneuver and then glossed over it moving directly to How-in-the-heck-have-ya-been-I’ve-seen-your-kids-on-Facebook conversation. It was great to catch up. But then… back at home…5 hours later….I still hadn’t resolved the issue in my head. We never addressed the handshake miss. I was tortured mentally from the failed greeting attempt. Did he judge me now? Did he go home thinking I was socially inept? Any of you have this problem? Or am I the only Jagoff? Yesterday on Facebook, we posted a contest. Whomever shared the picture of the Stroll Inn Pizza before the Steelers/49ers kickoff, was eligible to win a free pizza from our friends at the Stroll Inn in Kennedy Township.